Designed by 1+1>2 International Architecture Company to help promote green growing and living habit. Made from bamboo and plastic bottles. This vegetable nursery in Vietnam has been designed by 1+1>2 International Architecture Company to help promote green growing and living habits. The architecture firm worked alongside Action for the City to create the nursery that’s made almost entirely from bamboo and plastic bottles. The project was part of a collaboration between the countries of Vietnam and Ireland, and is designed to support the local citizens. According to the architects it is an “example of researching, [and] applying recycled materials in construction which could be disseminated to other models.” And while the nursery primarily functions as a greenhouse, it can also be used by the local farmers and workers as a rest place, or as an educational space for children to learn about their local ecosystem. 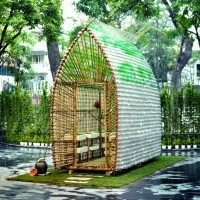 The house is made of bamboo and about 2000 plastic recycled bottles contributed by students and the community. These bottles help to provide a degree of protection against the wind and rain. They also serve as funnels, capturing raining water run-off and channelling it down to the plants. This plastic bottles wall helps adjusting day-lighting, temperature for vegetables. Water inlet tray on the roof helps irrigating. It is easy to move the nursery house to serve the cultivation demand because of the light weight. The unit has a floor area of 6 square meters (64 square feet) and is 3.6 meters tall (11.8 feet). The nursery was recently on display at the Museum of Women throughout November and December. It has since been moved on to Soc Son organic vegetable farm, where its being put to use as an active green house. This lightweight structure allows the vegetable nursery to be moved with ease. With the area of 6m2 and 3,6m high; unique, curious and friendly shape, this project is an interesting impression in the boundless paddy field. 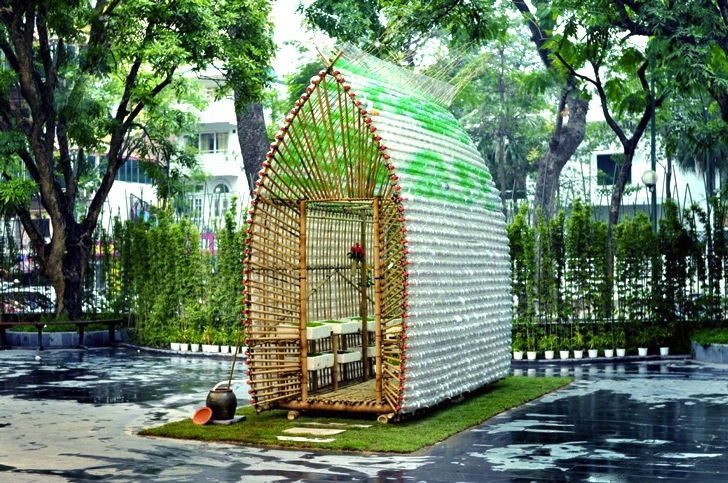 Vegetable nursery house is an image of combination between rural habitants and urban citizens; the cooperation between Vietnam and Ireland towards sustainable living habits. This is an example of researching, applying recycled materials in construction which could be disseminated to other models.